The nature of arthritis is such that the farmer/rancher with it can experience daily variations in levels of joint pain and mobility, which in turn affect his or her ability to complete essential work tasks. Farmers/ranchers with arthritis should work in environments consistent with their functional abilities and production levels. They need to attend to the limitations caused by their disability, including taking frequent breaks, and, as much as possible, conserving their energy and letting assistive technology help them do the work. A variety of assistive technology solutions can make farm/ranch work easier. The Missouri Farmer with Arthritis Project provides these recommendations to consider for tool and equipment modifications made to reduce joint stress, pain and fatigue. The goal is to allow the farmer to complete a task with the least amount of effort. to reduce friction, lessening the resistance between surfaces. Consider larger diameter wheels which have less rolling resistance. To use less force to manipulate objects and help to conserve energy. To reduce joint stress, pain, and fatigue. To help maintain a secure hold when hands are weak. To help hold an object if fingers do not fully close. To lessen tension required to maintain your hold on objects. Automatic tools, such as an inline power screwdriver, can eliminate the need for repetitive wrist twisting. 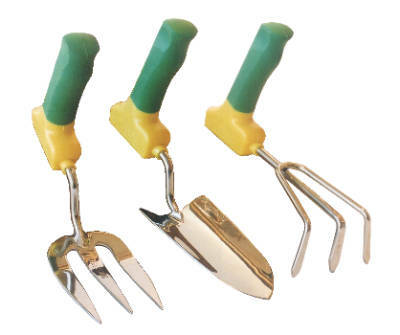 Spring-loaded or self-adjusting tools with ergonomic handles can reduce pressure and pain to joints. Ratcheting wrenches, PVC cutters, and pruning shears increase leverage and force with minimal pressure. Shoes made with shock absorbing materials, such as Sorbothane, can reduce secondary injuries to joints. Anti-vibration gloves can reduce the impact on a farmer’s or rancher’s hand and finger joints when working with tools. Anti-fatigue mats can be used to pad the floor in a milking parlor or shop for individuals with arthritis in their lower extremities or back. For a farmer or rancher with arthritis, the simple task of getting up and into a tractor or combine cab can be painful, very difficult, or sometimes impossible. The addition of a standing or chair lift may be the only viable way for a farmer or rancher with arthritis to gain access to a tractor or combine. 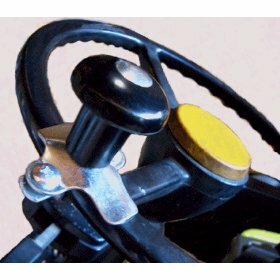 Sometimes simple modifications, such as the addition of a step and hand holds, to the tractor or other self-propelled machinery allow the operator to access the seat with reduced stress on their joints. Ergonomic hand controls may need to be installed if a farmer or rancher is unable to use his or her feet to operate the equipment with the standard floor-mounted controls. Remember, arthritic hands and feet need extra protection in colder climates. Therefore, tractor, truck, and combine cabs should be equipped with working heaters. A utility vehicle (UV) can be used to improve the mobility of a farmer or rancher with arthritis. UV's are great for transporting feed, tools or other equipment. Using the UV to haul items rather than manually carrying the items reduces the stress on the farmer’s or rancher’s hands, wrists, shoulders, hips, knees, and back. Commercially available UV's include the John Deere Gator, the Kawasaki Mule, and the Polaris Ranger. However, a new or used golf cart might serve this function as well. An individual’s abilities and work site requirements are crucial factors to consider when determining whether a UV is an appropriate choice. Before purchasing a UV, the farmer or rancher should try out the vehicle to be certain that it is accessible, easily operable, and places no added pressure on joints or other parts of his or her body. 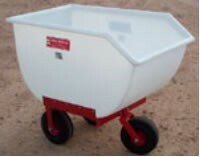 Automated feeding equipment (e.g., motorized feed carts, bulk feeding systems) can be used to reduce the manual labor involved with feeding livestock. Using other attachments on existing equipment, such as a skid steer loader equipped with a bale prong to place large hay bales in feeding areas, is another way to lessen the manual effort. Moving bales in this way means the farmer or rancher with arthritis need not repeatedly handle small bales of hay for feeding livestock. A farmer or rancher with arthritis needs to take added precautions to avoid unnecessary contact with the livestock while caring for them to limit further injury or prevent possible secondary injuries. Different types of assistive technology modifications are available, and their implementation depends on the type of livestock production, facilities, equipment and management needs. For example, based on need, modifications could be as simple as adding gates to the livestock working area. Setting up a series of gates or a squeeze chute can reduce the direct contact with livestock and reduce the risk of injury while sorting, treating or shipping animals. For dairy operations, a farmer with arthritis may find if helpful if he or she can reduce the number of times needed to stoop or reach under the cow during the milking operation. In this case, changing to automated milking unit detachers in their stanchion barns would be beneficial. In other situations, for a farmer with more severe arthritis, perhaps changing from a stanchion barn to a milking parlor should be considered to reduce stress on the arthritic joints resulting from stooping and reaching during milking. Other uses of simple assistive technologies might include the addition of drive through electric or automatic-opening gates at the entrance to livestock areas. 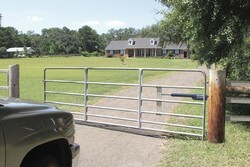 Automatic-opening and -closing gates can greatly reduce the number of times a farmer or rancher with arthritis needs to mount and dismount a tractor or other vehicle. Automatic hitching systems allow the farmer or rancher with arthritis to remain in a pick-up truck or tractor seat while hitching or unhitching equipment on level surfaces.